This week, we’re running a three-part series on the flawed way that we measure housing affordability. This post looks at exactly what’s wrong with one of the most common ways we determine what “affordable” means. Tomorrow, we’ll look at an alternative measure, and on Wednesday, we’ll examine the particular challenges of understanding “affordability” for owner-occupied homes. Given how much time media outlets, policy shops, and community groups have spent talking about America’s affordable housing crisis over the last few years, you might think that we’ve at least settled on a pretty good way to define what housing affordability actually is. After all, how can we talk about solving a problem if we don’t have a reliable way of determining who’s suffering, and where, and why? As an illustration, picture yourself as an employee of a local supermarket, making $1,500 a month. 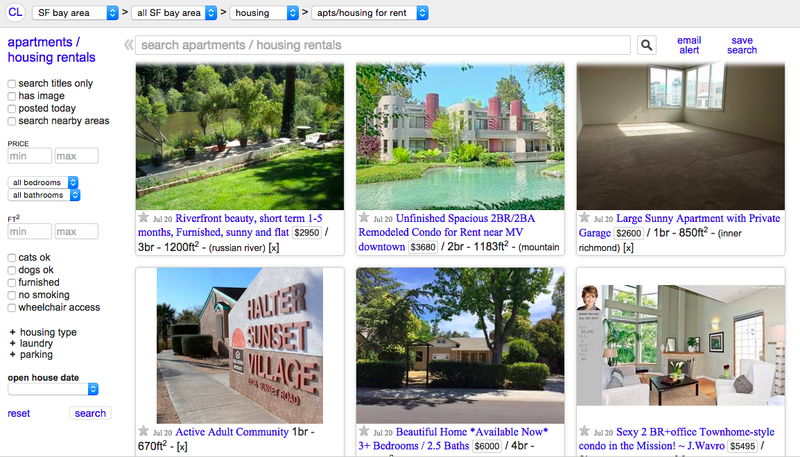 You live with a friend in an outlying neighborhood, and your share of rent is $400, plus $300 a month for car expenses. After all that, you have $800 a month left over – which dwindles pretty quickly between child care, groceries, and prescriptions. When you get sick or your car breaks down, you can’t avoid racking up some credit card debt. 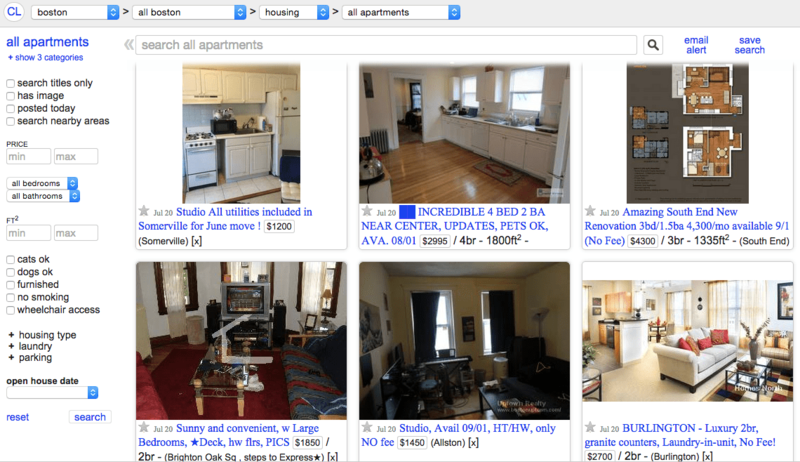 The front page of Craigslist for apartments in San Francisco. Across town, a man who works as a VP in marketing makes $8,000 a month. He pays $3,000 in rent for a brand new loft apartment near downtown. Because he can walk to work and takes public transit most other places, he buys a monthly pass for $100 and doesn’t own a car. After those costs, he’s got $4,900 to spend every month, which buys lots of nice meals out and international vacations while leaving room for healthy retirement savings. 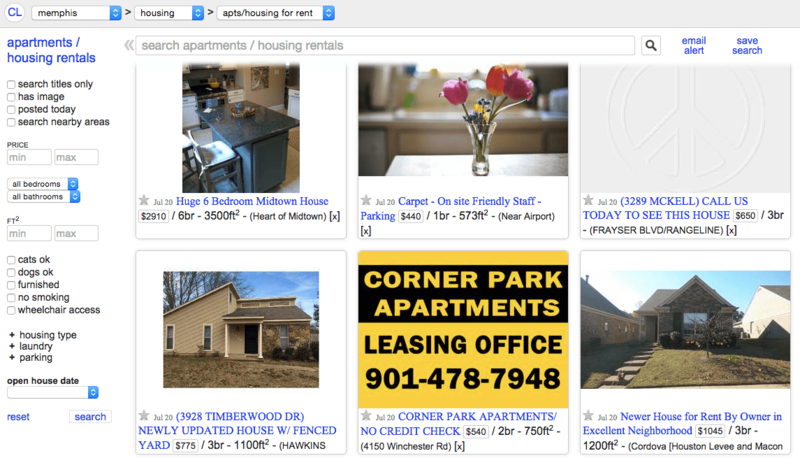 You’re having trouble making rent, and the marketing VP can make their payments easily. But according to our most common standard of housing affordability, it’s the VP who’s rent-burdened, and you’re doing fine. That’s because those standards rely on a simple ratio: if you pay more than 30% of your income in housing costs, your housing is unaffordable. If you don’t, it’s not. And the supermarket worker pays just 27% ($400 of $1,500), while the marketing VP pays 38% ($3,000 of $8,000). The supermarket/VP story is an extreme example, but it demonstrates several of the fundamental problems with the 30% threshold as a measure of housing affordability. 1. Equity. Most obviously, it doesn’t take into account that, depending on how much money you start with, leaving 70% of your income for all non-housing expenses may be plenty – or not nearly enough. Affluent people have the luxury of deciding whether to spend relatively large proportions of their incomes to buy housing in a better location, or with particular amenities, without sacrificing other necessities like food or clothing. Low-income people generally don’t. In that way, comparisons between people with different earnings can turn out misleading or unfair, as in the example above. But it can also fail in analyzing the burden of housing costs on people with similar incomes. Not everyone, after all, has the same non-housing obligations: for a healthy, childless twentysomething, a salary of $40,000 might easily cover housing, food, insurance, and other necessities. But someone who has to do much more non-housing spending – because of a chronic medical condition, say, or children with special needs – might struggle on the same income. 2. Other location-based costs. On top of that, there’s increasing recognition that housing choices are closely tied to other costs, which need to be considered part of the package. In other words, the cost of housing is less relevant than the total cost of a location. By far the most important of these other costs is transportation. While housing closer to the center of a metropolitan area is often more expensive, it also requires less driving – and often no driving at all, thanks to public transit – which saves a lot of money. According to Harvard’s Joint Center for Housing Studies, low-income people who manage to spend less than 30% of their income on housing actually end up paying $100 a month more on getting around, which eats into their savings, and sometimes erases them entirely. Some organizations, like Chicago’s Center for Neighborhood Technology, have tried to take this into account. CNT’s H+T Index shows the total housing and transportation costs for various locations, set against a combined affordability standard of 45% of income. That’s a major step forward – but using a ratio like 45% still has all the other problems of the 30% ratio we’ve already covered. 3. Quality of housing. The 30% threshold can’t tell us anything about what a given household is getting for their money. Few of us would say that affordable housing needs are met by homes that are low in cost but lacking in basic modern amenities like heating or indoor plumbing. While those problems are now relatively rare in major metropolitan areas, many cities have a stock of affordable housing that is predominantly located in neighborhoods with high crime rates, failing schools, few options for fresh food, or other major quality of life issues. Do that housing satisfy our need for affordability? This is an especially important question if we care about housing for its effects on opportunity and mobility. As recent research from Raj Chetty has reinforced, the kind of neighborhood you live in can dramatically change your prospects for living a comfortable middle-class life. It seems odd, in light of those findings, to measure housing access without taking into account whether that access includes communities that offer a shot at economic stability in addition to cheap rent. In conclusion, the way that we currently measure housing affordability – a simple 30% ratio of cost to income – is simply inadequate to the task. It fails to give us an equitable picture of who is in need and who isn’t; fails to consider the total cost of a location, missing housing-dependent payments, like transportation, that can add a significant burden to low-income households; and fails to consider questions of housing and neighborhood quality that exert significant influences on the life chances of the people who live there. Tomorrow, we’ll look at an alternative way to measure housing affordability that addresses some of these problems.